Cryptocurrency is basically a medium of exchange that’s done using cryptography. If you are a crypto trader or you are trying to become one, to make it a bit more convenient you need the right app to help you in the cryptocurrency world and help you learn more about it. Because so many apps are being created for this purpose, finding an efficient and easy to use cryptocurrency guide can be quite confusing. So, we searched and we have the app for this purpose. Let’s see what the app is about. What is The Crypto Pouch all about? 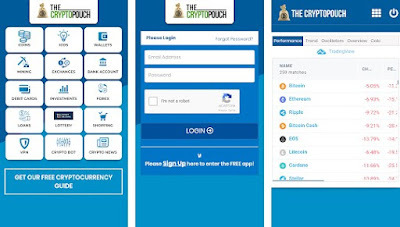 The Crypto Pouch is developed for Android users as one easy to use, efficient and helpful financial cryptocurrency guide that is created to help users enter the cryptocurrency world. With the help of the app, users are able to learn about cryptocurrencies and learn more transparent and stable financial system Through many referrals links users are offered to set their wallets, start to mine, invest in their funds and more. Completely safe and secure, users with the app will learn about investing and protecting their assets and funds. This cryptocurrency app has to offer users many features that will help them and guide them to the world of cryptocurrencies. Using this app is helping users to get introduced to cryptocurrencies and through the referral links offered on the app users have the chance to start to set up their cryptocurrency wallets, sign up for cryptocurrency exchanges, start to mine, set up debit cards, banks and invest in their funds and assets. These referral links can lead users to free coins or discounts as well. On the app users can find available cryptocurrency charts and signals, and they can also go on cryptocurrency shopping or get cryptocurrency lottery tickets. The app is helping users to learn to sign up for VPN in order to protect themselves. The latest cryptocurrency news is constantly available on the app so the user can keep track with the cryptocurrency world. The app allows users to safely invest, hold their assets and wallets securely and protect their portfolio. Download it for free on Google Play to learn how to securely and safely invest in cryptocurrencies!